Appear in court on the day of the hearing. You will not have to argue your case at this point. 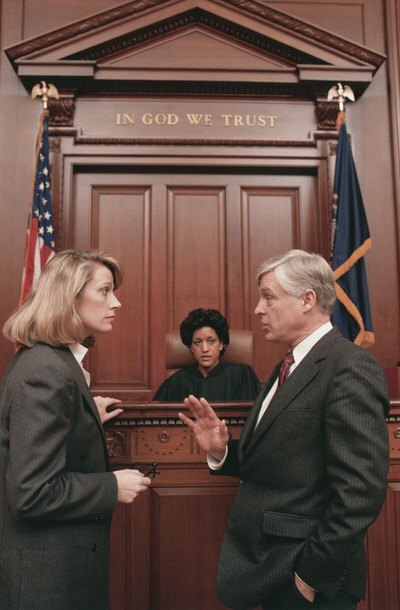 You only have to show up to advise the court that you are objecting to the will. File a written objection with the court after you have attended the hearing, explaining why you think the judge should invalidate the will and refuse to enter it into probate. You must also send a copy of your objection to the executor of the will, or the person who submitted the will for probate, as well as the deceased’s heirs and the will’s beneficiaries. Respond to any heir, beneficiary or executor who “demurs” to your written objection, or asks the court to dismiss it. You have 10 days to do this after you receive notice that someone has demurred. Your response should be to revise your original objection so that it meets legal standards. Generally, a beneficiary, the executor, or his attorney will demur because of some procedural error, such as invalid grounds to contest the will. If this occurs, you should immediately seek the help of your own attorney because you have limited time to resubmit a corrected objection. If you don’t do it right, the court might dismiss your case. Review the executor’s or beneficiaries’ arguments to your grounds if the judge overrules the demurral. The demurral simply objected to the court allowing you to challenge the will in the first place. If you win that hurdle, the executor and beneficiaries are allowed to respond again, this time specifically to your allegations regarding why the will isn’t valid. Their arguments will usually be the same ones they use at trial and will give you some idea of what to expect. The court will assign a trial date after it receives these responding arguments. Present your case on the day of the trial. You should enlist the services of an attorney because most courts require the same level of legal expertise from "pro se litigants," or people who represent themselves, as they do from lawyers. When the judge has heard all the evidence, he will not issue a decision right away. He will write an opinion and issue a judgment, usually within a few weeks’ time.